Our original plan after downing pizza, ribs and poutine at Big Daddy's was to go for a second course of poutine at Big Reds Poutine truck only a few blocks away. Of course we experienced an epic fail because the truck wasn't there! Ultimately, it was a blessing in disguise as we would've been overloaded with fries and gravy as a result (is that necessarily a bad thing?). 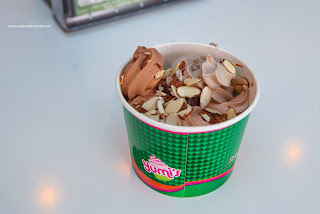 Our backup plan was to return to the Valley Fair Mall for some refreshing froyo at Yumi's, a couple of doors down from Big Daddy's. 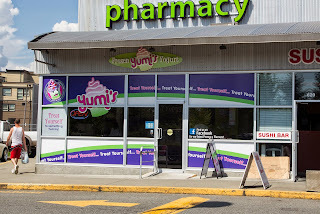 Looking like a clone of Menchies, but on a smaller scale, we had no expectations for Yumi's. 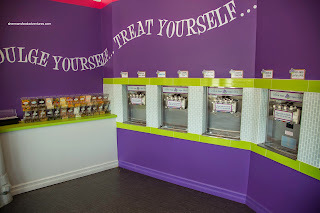 Even with the in mind, we were pleasantly surprised with the pricing as none of our creations cost over $5.00. I decided to try the Berry Cheesecake with strawberries, raspberries and kiwi. 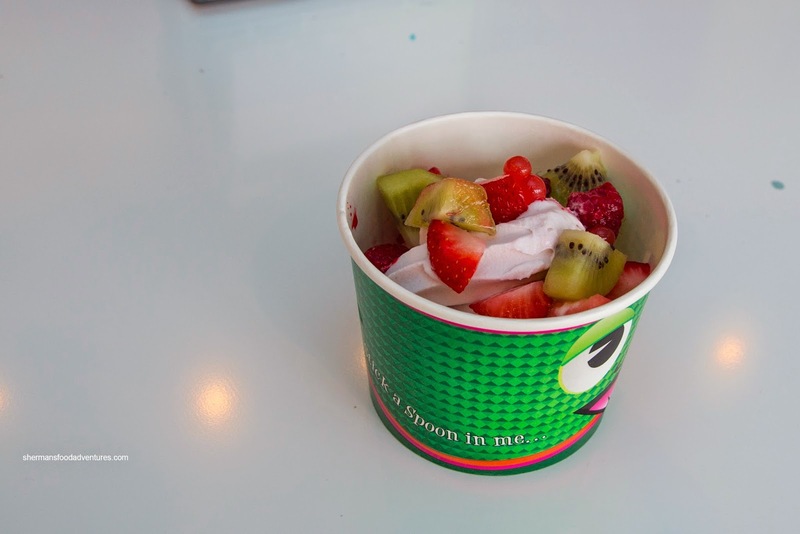 I found the froyo to be creamy and smooth with only a purposeful amount of sweetness. Although masked partly by the natural tartness of the yogurt, I still got some background cream cheese flavour. The fruit was pretty ripe and sweet, but the raspberries looked a little overripe. Bam Bam got inspired by the Peanut Butter Cup froyo and loaded it up with Reese Pieces, mini peanut butter cups and peanut butter cup chunks. One taste and it was pretty clear why he chose that flavour. 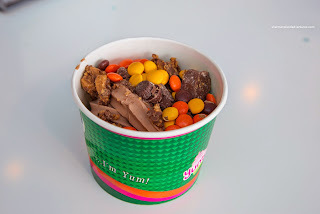 It was creamy and powerfully peanut buttery while not being sickingly sweet. Of course it worked really well with his chosen toppings. Dark Helmet went for a trio of flavours including the aforementioned Peanut Butter, Cookie Monster and Fat-Free Chocolate. He simply added shaved almonds to complete his treat. As smooth as the rest, we were surprised with the fat-free chocolate. Keeping with the theme as the other flavours, the sugar content was conservative. 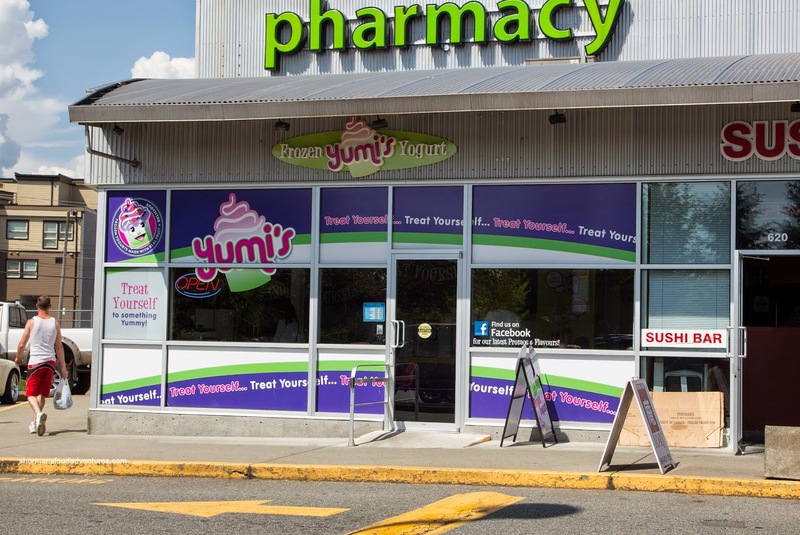 Well, I guess we were meant to miss Big Reds, because we would've have returned to try Yumi's otherwise. What a surprise that the froyo was on point and the cost was reasonable.